I've searched these forums, & not found a similar problem. I'm having difficulty getting the model to render true to the colours that I have selected. I've created a new material paint colour (for every family & item)... I've tried painting the surfaces (of the extrusions within the families). I've set the material rendering appearance to the colour I want, then ticked the "use render appearance for shading" box. I've tried everything that I can think of, but am obviously missing something. If anyone can offer hints or advice, I'd appreciate it. I've attached the 3-D model view as well as what I get when rendering the same view. is it the window frame and mullions that are the issue. they look black and are rendering to look like wood? Yeah, that is why I changed the render appearances. 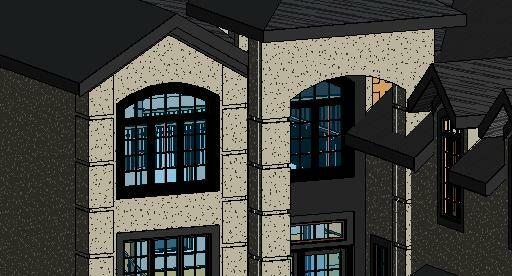 Then chose the graphics to use render appearance for shading. Does anyone have a solution to this problem im having the same issue, colours look correct in 'realistic/shaded' view but when it renders i get completely diffrent colours, i have changed everything i know possible to the same colour too, same goes for Images such as Stonework, renders a completely different colour. Are you sure you don't have a phase filter in the view overriding the material? No Just checked all that changing between new/demo/existing etc, didnt know that stuff existed till now just learnt phasing off youtube still a bit fresh to Revit. Remember, the project rules! Once a family is loaded into a project, the materials assigned are controlled in the project. Changing them is the familty doesn't matter unless you remove the family from the project and then reload it.